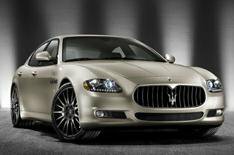 Maserati Quattroporte special edition | What Car? This is the Maserati Quattroporte Sport GT-S Awards Edition, which celebrates the 'countless' awards the luxury car has received. The Quattoporte has received 56 awards in 14 countries covering four continents. The Awards Edition will be unveiled at the Geneva motor show at the beginning of March, and will be available for special order in the second half of 2010,. The car has a unique pearlescent grey/gold paint finish, burnished chrome exterior detailing, grey alloy wheels and hand-polished brake callipers. The interior has been given a makeover by designer furniture-maker Poltrona Frau, with an undulating pattern on the seats, which use perforated Alcantara. The boot of the car is finished in black and chrome, while floor mats are softer than usual. Prices are available on application, says Maserati.